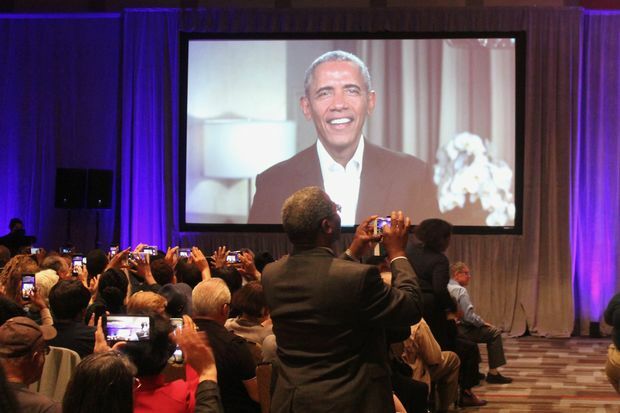 About halfway through the community meeting, where Obama Foundation officials updated the community and received feedback from the public, the former president dropped into the meeting via satellite, surprising and delighting the hundreds in attendance. 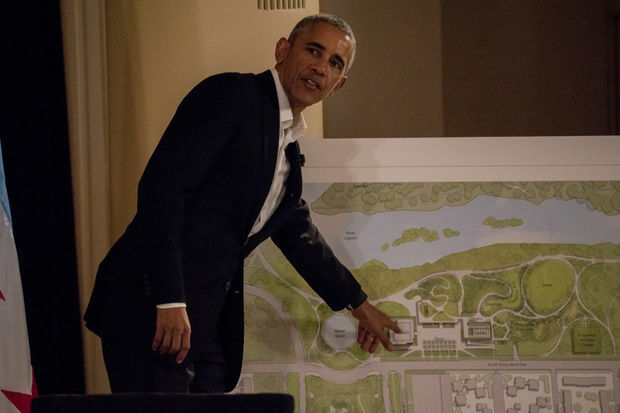 SOUTH LOOP — Community members hoping to get questions answered about revised plans for the Obama Presidential Center got quite the surprise Thursday night. About halfway through a meeting where Obama Foundation officials were giving updates on the project and taking feedback from the public, former President Barack Obama dropped into the meeting via satellite — delighting the hundreds in attendance. "What I wanted to do was emphasize to all of you the reason that I wanted to have this presidential center on the South Side of Chicago," Obama said. "It’s not just because that place is near and dear to my heart. It’s not just because its home for us. It’s because the South Side of Chicago, I think, is representative of all the amazing talent and creativity and community bonds that so often aren’t highlighted in the media." 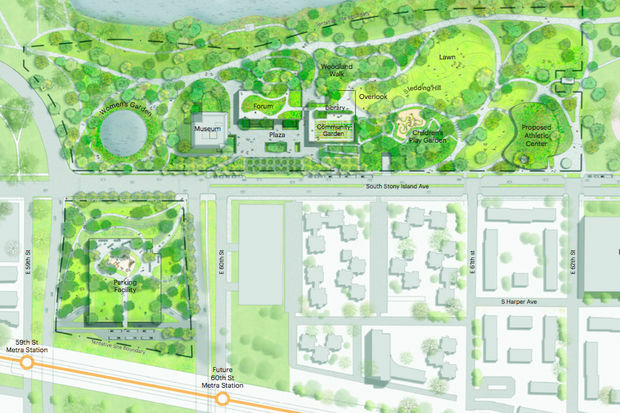 Thursday will be the first time revised plans for the Obama Presidential Center campus has been presented to the public since initial plans were unveiled in May. Obama said he wants his center to be an agent of change that shows off the community, too. "I wanted to make sure that we had a presidential center that was not just some sort of monument that people would go and visit, then leave and nothing happens, but rather that we use this as a tool to highlight everything that’s already going on there that’s positive," he said. One way he'll be showing off the community and highlighting positive aspects will be "setting up a studio where we can have Chance [the Rapper] come in and teach young people how to do music," Obama said. The center will be the most transformative project to take place on the South Side since the construction of the Dan Ryan Expy., said WVON's Melody Spann Cooper, a co-chairwoman on the foundation's inclusion council. "It was change. It was controversial. It stirred emotion, but in the end it brought innovation, became and remains one of the busiest expressways in the country, and became the gateway to Chicago's black middle class," she said. The Thursday night meeting was a collection of first-time opportunities. After numerous meetings in South Shore, this one was held at McCormick Place Hyatt Regency, 2233 S. Martin Luther King Drive. And while plans already have been revealed to move the campus north to include parts of the Midway Plaisance for a parking garage and civics programming, it was the first time officials sold their ideas directly to the public. "We're going to do something very different here," said Mike Strautmanis, vice president of civic engagement. "The purpose of the Obama Presidential Center is to create a place that inspires and entertains. That gives families a safe and enjoyable place to gather and have fun on the South Side of Chicago. And most importantly to inspire them to make change in their communities." The project itself will make huge changes to the community's landscape, and leading those changes are architects Tod Williams and Billie Tsien. Their most recent design change to the plans included reorienting the campus closer to the University of Chicago. The updated plans help connect the project to the Museum of Science and Industry, they said. "It's really completing that whole long line of green strip necklace of parks that run along the edge of Chicago. That's always been here, and we're going to make it a better, more exciting place to be," Tsien said. The site plan, which has been shown privately to community leaders and distributed to the media, has nixed overhead pedestrian bridges while maintaining some controversial features, like removing sections of Cornell Drive to extend the campus right up to the shores of the lagoon in Jackson Park. "We're making it easier for people to walk through and get to the lagoon, and eventually you can get to Lake Michigan. We're trying to make this campus something you can walk through — not something you can walk around," Tsien said. By removing Cornell, they should be able to add park space, Williams said. "We can make it vibrant. We can make it beautiful. We can find places where it's serene. So that it's more democratic space, it's more public space, it's more space for the community and acknowledgement of the great power of Jackson Park," he said. About 20 residents pushing for the project to benefit the community camped out in front of the hotel a day before the meeting hoping to get a front row seat to ensure they could ask officials to define consequences for contractors that don’t live up to the demands of diverse hiring set down by the foundation. Instead, Woodlawn resident Jeannette Taylor was able to lay out her argument directly to Obama. "As much as this center is about opportunity, if we don’t have clear protection in place, rents will increase and the people of Woodlawn who’ve been dealing with disinvestment for years will be pushed out," she said, adding "if you’re so interested in investment in Woodlawn, please sign a community benefits agreement." While the former president would not agree to a community benefits agreement, he said the foundation would be setting up clear standards on who would be hired and how it would ensure small businesses and residents benefited from the building. That would be based on input from the community, he said. "The community benefits agreement concept is actually one that I think can be a really useful tool if you have, let’s say, a bunch of developers coming in who are wanting to build a high-rise or wanting to build some sort of for-profit enterprise in your neighborhood," Obama said. "But here’s the thing: We’re a nonprofit that [isn't] making money. We are just bringing money to the community." His concern with a community benefits agreement is that it would force the organization to side with a group, and one organization would end up speaking for the entire community, which isn't a good idea considering Chicago's history, he said. "I know the neighborhood. I know that the minute you start saying 'Well, we’re thinking about signing something that will determine who’s getting jobs and contracts and this and that …" Next thing I know, I’ve got 20 organizations coming out of the woodworks," Obama said.